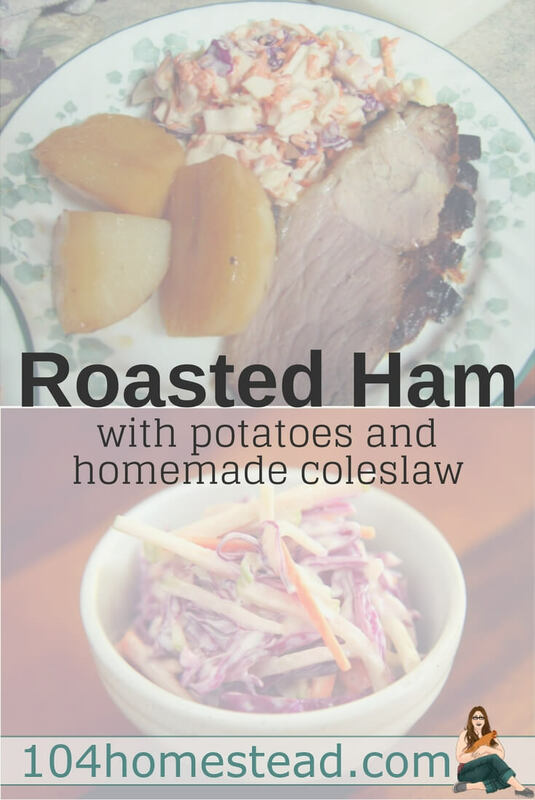 A roasted ham dinner is so delicious and really, so very easy to make. A meal like this is wonderful for Sunday dinners and it’s easy to make lots so there will be leftovers. Maybe with the last of the left over ham, we will dice it up and turn it into lentil soup! 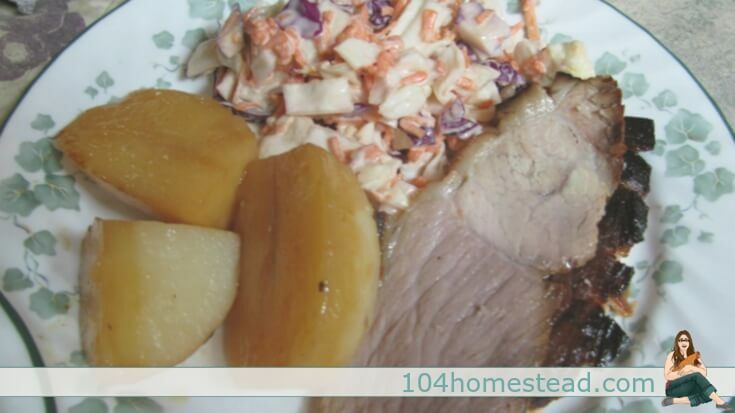 A favourite for us is roasted homegrown smoked ham with potatoes alongside and fresh coleslaw. We make a big meal so we can eat from it for days afterwards. Over the next few days, we’ll use up any extra ham in omelets, on pizza or with cheese on grilled sandwiches. For us this roasted ham meal can be a totally homegrown dinner – the benefit from growing so much of our own food. We’re enjoying eat healthier and much cheaper because we have a garden. We also raise pigs so we are able to have a lot of homegrown meat in the freezer. I usually make a Coleslaw to serve alongside. We always grow a lot of cabbage not only for coleslaws, but also for sauerkraut, which I make and preserve every year. Turn your oven on to 350. Score your ham crosswise in each direction. Put the whole cloves in the slits of the ham. You’ll remove the cloves before you serve the meal. 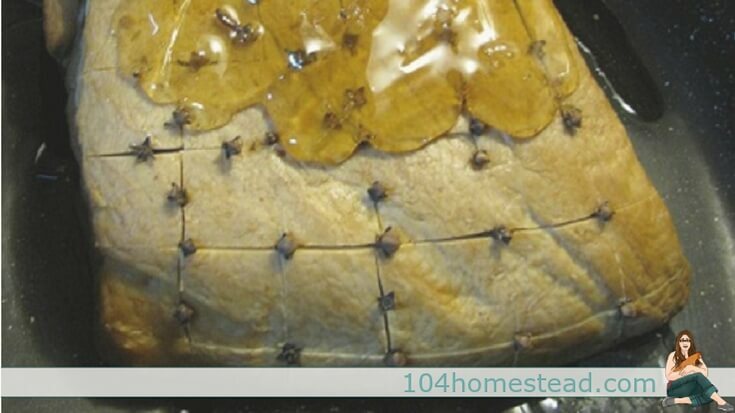 Put the ham in a large roasting pan; add ½ inch water. Pour pure maple syrup on top and brush it in all over the ham. Use as much as you like. Baste a little more on part way through roasting and again at the end when you remove from the oven. Sprinkle with salt and pepper and put it in the oven. About 60 minutes later, peel potatoes, slice in half and add them to the roasting pan. Toss them all so they get covered in the water. Let it all roast for about another 60 minutes. Toss the potatoes again part way through, just to be sure they are moist. When you take the ham from the oven, let it rest on the counter for about 20 minutes before carving. Cover the potatoes to keep the warm. You can get the printable version of this recipe here. 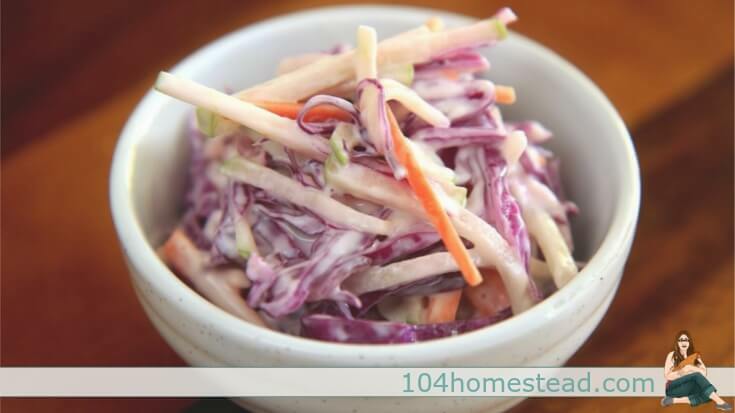 Wash the cabbages and finely slice into shredded pieces. Toss in large bowl with carrot and seeds. Add dressing and toss some more. Serve cold. Together this makes an easy but delicious dinner. The easy clean up is nice too! Roast dinners are an easy way to put a great meal on the table. Beginning cooks may think making a meal like this is hard work, but it isn’t! At all! Whether you use ham, beef, pork or chicken, you basically put it in a preheated oven, with a bit of water or butter and let it cook awhile. Later, add your veggies, toss them so they are moist with liquid and that is it. You can get other things done while dinner is cooking. Let people think you have spent all of your day in the kitchen – you (and I) know better. Annie lives in the bush in BC, Canada. Since it takes her 20 minutes just to get to her mailbox, Annie and her husband try to live as self sufficiently as possible. In her spare time, she runs a Garlic farm and ships naturally grown garlic all over Canada. Follow her adventures on her website, Country Living in a Cariboo Valley.